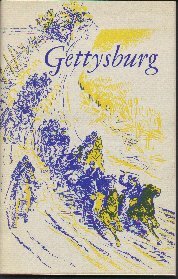 "Gettysburg Booklet - National Park Handbook Series - 1954"
(G102) Gettysburg Booklet - National Park Handbook Series - 1954- Condition: Very Good Over 50 pages of historical information about Gettysburg. Includes wonderful B&W photos on every page. There are 12 B&W Full Page Pictures from the famous E.D. Briscoe Battle Paintings. This book contains wonderful background details on the Generals, actual battle, establishing the park, and much more information. The Front cover is done in Blue Ink with Yellow Highlights. It measures 6" by 9" and is Paperback. Price: $10.00 + Shipping.